Insert coffee to begin. Are you a morning person? If I ask my sister this I am sure she’ll punch me in the face. Whenever I think of people getting up smiled in the morning, the picture of her immediately pops up: grumpy, shaggy and totally sad. I used to be that person in the past. Now that I have my daughter things have changed. I have to wake up early even on weekends (8.30 maximum on good days). And to tell you the truth it feels great. It is a matter of habit, but once you get used to getting up early you won’t miss the sleeping ins. At least not all the time J Especially if you love coffee like me. The best part of my mornings, besides cuddling with my daughter, are classic American pancakes served with a warm cup of coffee. I mean I am not addicted to coffee, we are just in a committed relationship, as a wise man (or woman) once said. How else can you get through the day with an extra energetic 2-year-old? Since my maternity leave has ended work days can be really tough. I get home exhausted and there is that above mentioned energetic 2-year-old all eager to play. Plus, there are my daily chores. That is why an ordinary cup of coffee a day isn’t enough to keep the grumpy away in my case. So what did I do? I decided to add coffee to my favorite pancakes. A double dosage of liquid sanity! I love coffee pancakes. And don’t think that there is just one type of coffee pancakes out there. Make yourself a favor and download a recipe app like, and your life will become much easier when it comes to finding fresh new ideas. 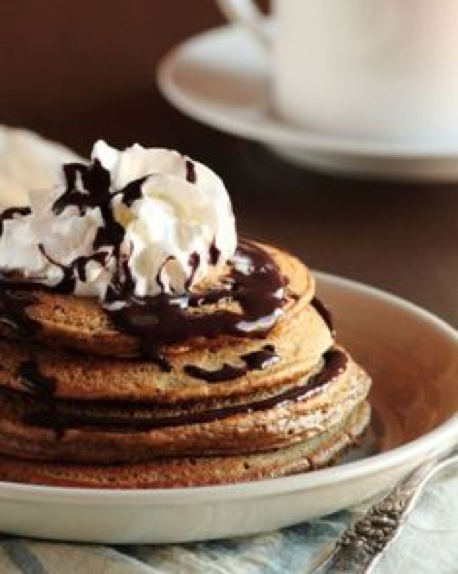 Basic coffee pancakes are made with 2 tablespoons of instant coffee granules added to the batter directly or mixed with two tablespoon of hot water before adding them. Tip: if you are just adding coffee granules directly into the batter, use an electric mixer or a blender to mix the wet ingredients. That is the best way to make sure the granules have dissolved. It is important to know that instant coffee yields best real-coffee-tasting pancakes, unlike espresso coffee. I’ve tried it, the coffee taste was nowhere to be found. However, for a stronger variation you can add ¼ teaspoon coffee extract plus 1 cup brewed coffee besides the regular 2 tablespoons of coffee. 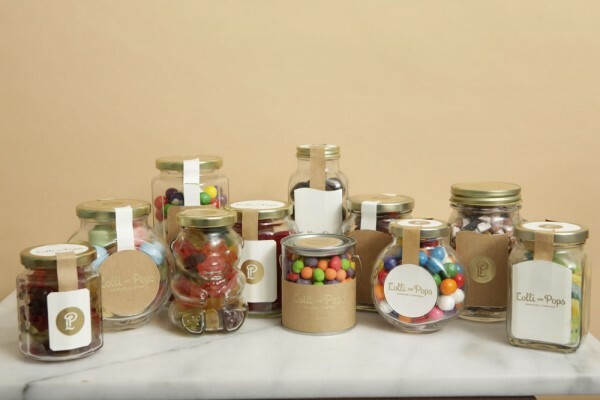 Bear in mind that there are many kinds of flavored instant coffees you can use. 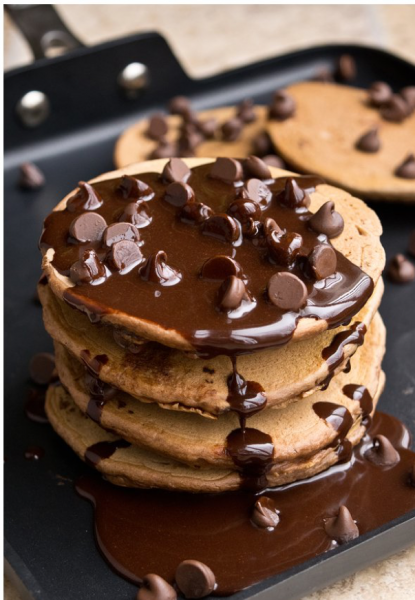 For example, you can make chocolate pancakes (by adding cocoa powder or chocolate chips into the batter) and add some chocolate instant coffee to double the chocolatey taste. 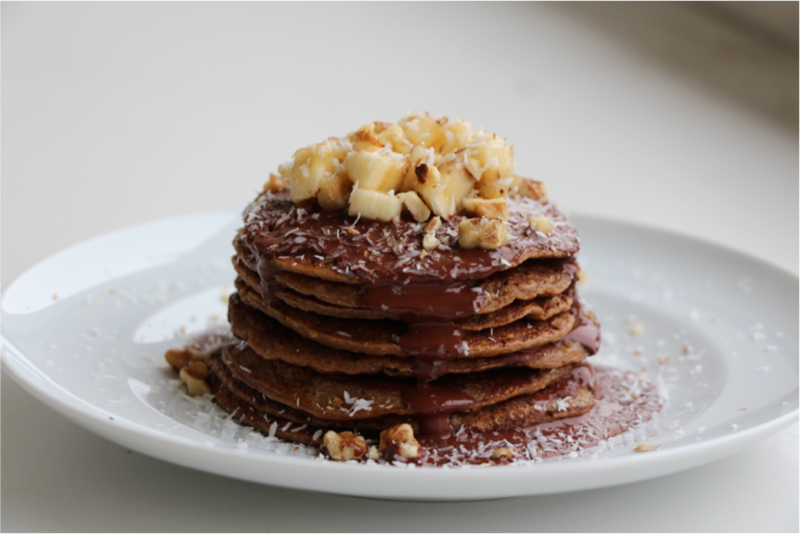 Coffee pancakes pair very well with hazelnuts, so feel free to chop some and fold them in the batter and on top of the pancakes. 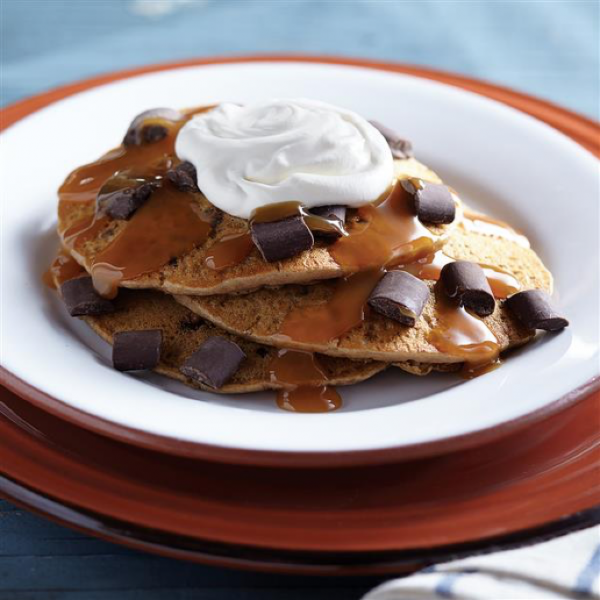 What about my favorite: the coffee caramel pancake recipes? 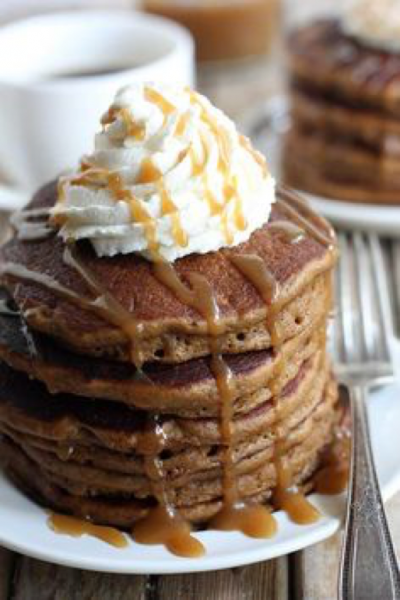 The fastest and most efficient recipe is the basic coffee pancakes recipe smothered in caramel syrup. The syrup is made of whipping cream, brown sugar, butter and vanilla. Real caramel latte taste! 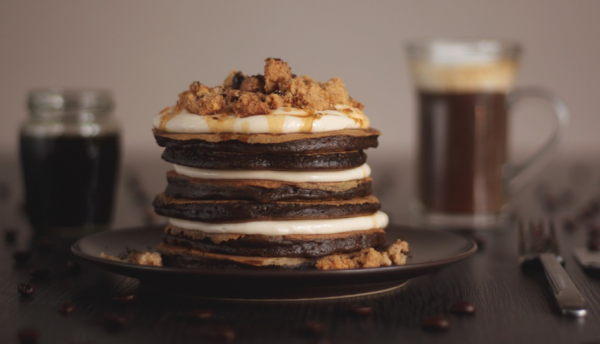 Or indulge yourself in a real dessert-tiramisu pancakes. The recipe requires dipping each pancake into espresso and spreading whipped cream on top. Sift with a thin layer of cocoa powder over the cream. 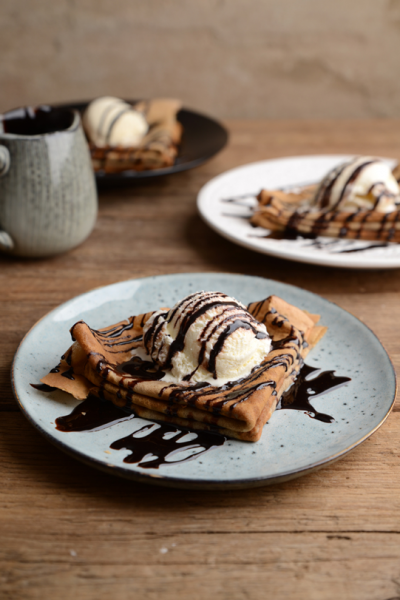 Oh yes, you can always put a scoop of ice cream on top of your coffee pancakes. Vanilla is my choice. Two things before I go: don’t give these pancakes to your children, unless you make the basic recipe with just 1-2 tablespoons of coffee (if your children are not prone to hyperactivity, which I doubt) and make sure you don’t eat them on daily bases as well. Once a week would suffice.